It's October - let's review something horrifying and monstrous! Geologist Sean Fifield is hired to take part in a Weyland-Yutani expedition following a mysterious star map to a distant moon dubbed LV-223. His fate is sealed after being exposed to a mutagenic black liquid discovered within an ancient pyramid, which mutates him into a mindless, murderous monster. See that first word up there, people who want to nitpick Prometheus? "Geologist." Not "cartographer." One of the popular complaints is that Fifield and Millburn never should have gotten lost in the Engineers' temple, because he'd activated his Parameter Uplink Spectagraphs and sent them on a tour of the facility. Which, yes, is true, but the PUPS are sending their holographic map data back to the ship; there's never any indication that Fifield or anyone not standing immediately on the bridge of the ship has any access to it. There's literally a scene of Idris Elba radioing people directions using the map that only he can see, but sure, yeah, keep complaining about the fact that two guys got lost. And then keep that in mind the next time you're at the mall and can't remember which door you went in. Fifield was solictied at the same time as Shaw - was cancelled at the same time as her, too! But because NECA never, ever gives up, they hauled those prototypes out and released them to coincide with Alient: Covenant, meaning we finally get Mr. Dirty, here. Below the neck, he uses the same molds as David 8, just painted in darker, dirtier colors - after all, he has fallen face-first into the black goo by this point, so there's no reason his suit would still be looking pristine. The sculpt is just as good today as it was five years ago, with heavy protective plating over the flexible suit beneath - it's just been given a heavy wash to make it look filthy. The original plan for Fifield's mutated form would have been very xenomorph-y, with a translucent dome head, spindly limbs, and dorsal tubes poking out of his back. But then Ridley Scott wanted to pretend Prometheus "wasn't" connected to Alien, wink-wink, so the finished CGI was scrapped and instead we got (Mission Impossible villain) Sean Harris in heavy prosthetic makeup. His head is weird and lumpy, his skin is a pitted mess with a deep crack running down the forehead, and his teeth look like they're trying to escape from his mouth. It's definitely gross and inhuman, and the sculpt captures the movie makeup wonderfully, but the other design would have been superior in every regard. It also would have meant NECA needed to create an entirely new body for him, which was definitely out of the budget for this line. Heck, they couldn't even spring to change his articulation! 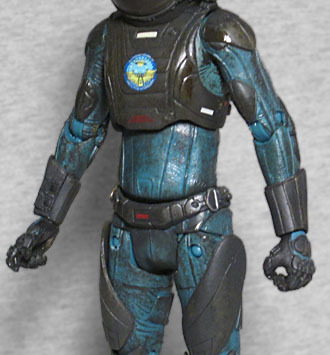 Remember, the original Prometheus figures came out in that span when NECA had apparently forgotten how to make proper swivel/hinge elbow joints, so this body's forearms are as useless as the Planet of the Apes figures'. 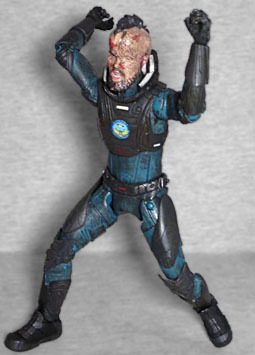 Fifield severely needs increased articulation, so you could get him into inhuman poses, like when he first comes back to the ship and is all twisted up in a pile. At least he gets a new helmet. Since the crew's suits were airtight, Fifield would have been fine faceplanting in the goo, if the front of his helmet hadn't first been dissolved by Hammerpede blood. But it was, so he wasn't. 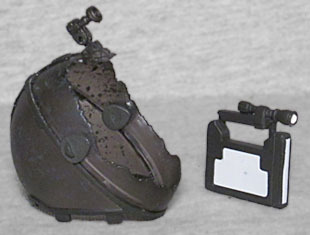 The helmet included with this figure is missing its front panel, and instead of being clear, it's painted with the same kind of schmutz as the rest of the suit. It's pretty difficult to get the piece on over his weird head - the trick is to tip his chin down, slide the helmet over the back of his cranium, then wiggle it down onto the collar. And be aware that you might scrape some paint off his beard. He also includes the tiny shoulder-mounted camera and the same handheld flashlight thing as David, because... inertia? Neither of them are necessary inclusions, and even if it wouldn't have been completely accurate, we'd have rather gotten an alternate "deleted scene" head. I never saw Fifield at my local Toys Я Us, because whoever was in charge of stocking the NECA products there was either forgetful, lazy, or just plain ol' bad at their job. But when I was on my grand farewell tour, he finally made an appearance, and I was glad to be able to pick him up - even if he's not as good a toy as he could have been.